Fish in hot spicy garlic sauce is a classic Malaysian dish . The spicy garlic sauce represents the Malaysian Chinese flavor. This sauce is very popular in most street food stalls in Malaysia due to its special flavor. Here garlic and onion are sauteed in conventional Chinese way and then combined with dried red chilies along with tomato ketchup. As it is full of aromatic flavor of garlic, this sauce is named so. Normally this sauce is used for topping deep fried fish or baked fish or steamed fish or any seafood or meat. The plating of this itself is appetizing. 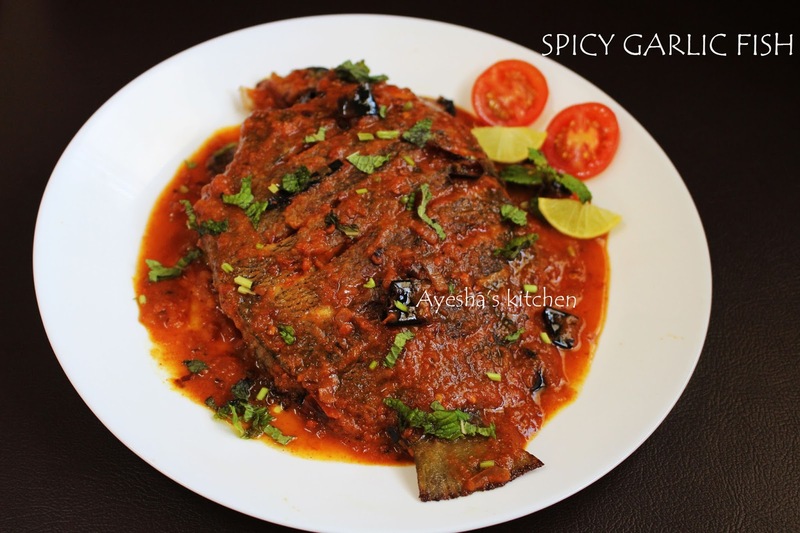 Moreover the fine flavor of garlic along with tangy tomato ketchup and hot red chili makes this dish heavenly delicious. Here is the recipe showing how to make spicy garlic fish or fish in hot spicy garlic sauce. Do try. 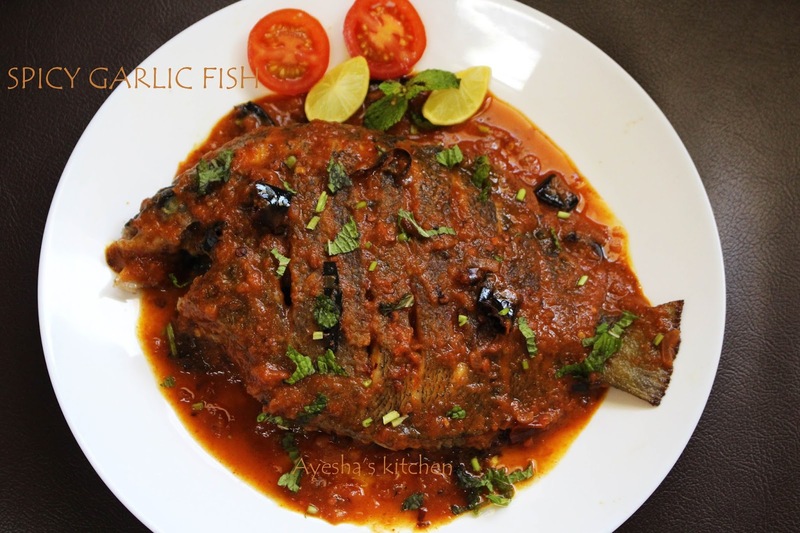 Fish - 2 nos..you can use any fish like pearl spot(karimeen), pomfret, mackerel etc..
Heat few tsp of oil in a pan and fry the fish. When half was done, sprinkle cornflour over each side and again fry for few minutes. Transfer to a plate when both sides become golden. Now prepare the sauce. Heat oil in a wok and add chopped dried red chilies. Saute for few minutes over medium flame and then add onion chopped. Saute until fragrant and then add spicy garlic sauce. Stir well and check for salt. If you want more thick gravy, you can add cornflour water (1 tsp mixed in a quarter cup). Cook until thickens. 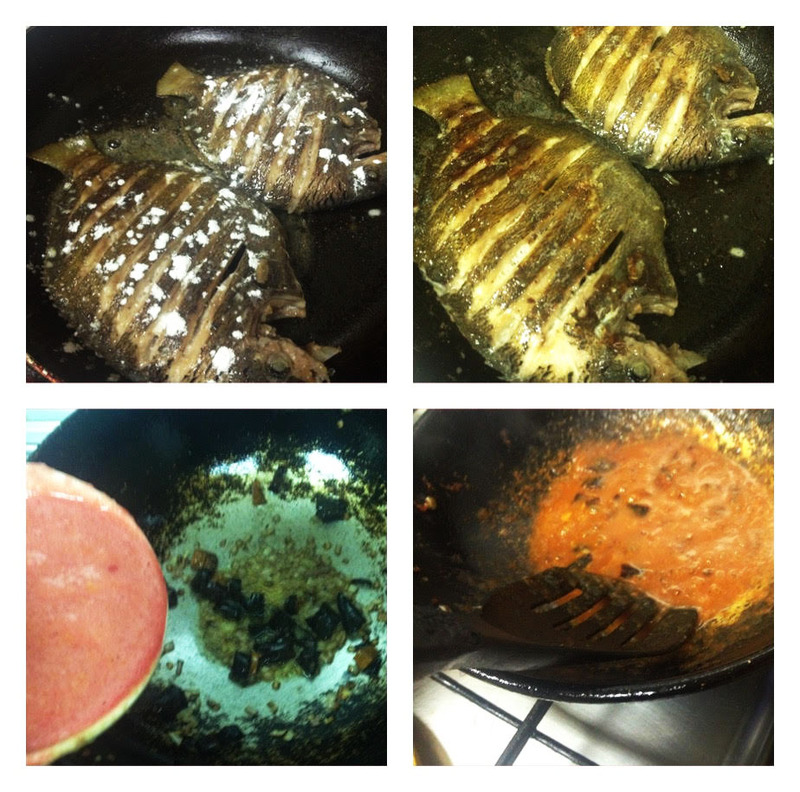 Add the fried fish to it and coat well with sauce. Add one fish at a time. Transfer it to a plate along with some sauce over it. Garnish with chopped coriander leaves. Tomato ketchup - 10 tbsp / 150 ml, instead i boiled one big tomato with skin and when done removed the skin, blended to a fine paste. Saute garlic and onion until fragrant in few tsp of oil over medium flame. When done, add remaining ingredients and seasoning. Cook on a low flame until thickens. Remove from heat.